psc on board: WHCH v-0.2 is out! 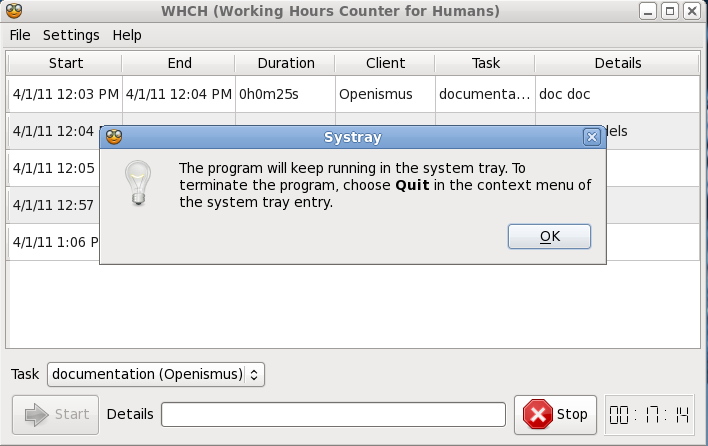 Working Hours Counter for Humans (WHCH) is growing step by step and little by little. I released the 0.1 version in January and it was already time for a 0.2 release with some new features. I made WHCH a single instance application. Every time the user tries to lunch a new instance, the window related to the current primary running instance will be displayed. I added a desktop file and an icon image, so now the application is available from the desktop's menu. Regarding to the icon image, I am using a test one for the moment, taken from the Tango Desktop Project. Now, each of the tasks available in the list of tasks, is followed by the client it is related to. The start, end and duration time fields are exported into Mediawiki format in a more human-readable way and the total number of hours worked per week are calculated now too. WHCH is now visible in and accessible from the notification area. 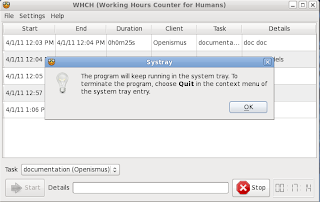 If the user closes the window, the application will keep running in the system tray. 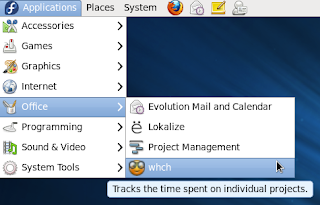 When hovering the mouse over the tray's icon, a tooltip will display the time that has been spent on the task the user is currently working on. For the next release, I'm among other features, working on creating a 'History View'. As a consequence of this task I will need to rearrange some code and that is going to be a very interesting, and probably long, learning experience. Let's see what comes out of it! If you are interested, you can find and follow the project on GitHub or download the tar.gz. As always, all comments are welcome, as are merge requests. I found and fixed a bug in WHCH regarding to the time counting displayed in the main view, and created therefore a tarball release for a new 0.2.1 version too. This is really nice work! We use FreshBooks at work and I would love to use something like this to send them data. PS - I think your comment form is broken in FF4 and possibly Safari. Why didn't you use an sqlite db for storage instead of implementing one on xml? You whould have had the model for free (QSqlTableModel) and could was compatibile with the hamster format. Nice, BUT: how does it differentiate itself from hamster-applet? Blah: thank you for your feedback! Lorenzo: I used an .xml file because I found it more suitable for my purpose, which was to translate it into different formats in the future, for instance Wikimedia format, which is the one currently available in the app. On the other hand, I wanted to have some human-readable format that users could edit if they wanted to. - WHCH is written in Qt. - WHCH is a much simple app, in terms of functionality and in terms of GUI. What I mean with this, is that WHCH has less features and it is not so mature as hamster. My intention has been to keep it simple for the moment.